The initiative, Sustainable Development Goals Champions, which was officially announced during the i-MBA and CSE Annual Sustainability Workshop on March 21st, is launched in the framework of the partnership between the Centre for Sustainability and Excellence (CSE) and the MBA International of the Athens University of Economics and Business with the United Nations, aiming to increase awareness and developing new initiatives regarding the 17 Sustainable Development Goals -SDGs of the UN. The common action “UN Partnership #SDGAction23013”, aims at promoting sustainable development and corporate responsibility in Greece through the Sustainable Development Goals – SDGs, as well as to educate students, young entrepreneurs, corporations and organizations on how they can contribute to a better future for the economy, society and environment. 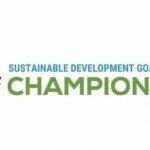 The Sustainable Development Champions initiative is addressed to all business people, from top level executives and business owners, to managers in all functions and young entrepreneurs, who wish to make a positive impact in their business and in the world. The participants will need to design and implement an innovative action or initiative in their organization during 2018, which has to be connected with one or more of the 17 Sustainable Development Goals, in order to become recognized as Sustainable Development Goals Champions for the impact of their action. The actions will be evaluated according to the criteria of SDGs and will be published in a booklet entitled Sustainable Development Goals Champions, and promoted in special events, such as the i-MBA – CSE Annual Sustainability Summit 2019). The 17 Sustainable Development Goals are the main core of the 2030 Agenda for Sustainable Development, a united effort by the 193 members of the United Nations, which aim at actively contributing to the implementation of specific common goals for sustainable development until 2030. The goals cover issues such as poverty and inequality, climate change, water and environment quality, governance, transparency and corruption. Business organizations’ support of the achievement of SDGs is of utmost importance for succeeding with the long-term and over reaching objective of building a more sustainable and fair world for all. To register and for more information please contact Mrs. Zeta Chatziantoniou 210 8085565, communications@cse-net.org.